Jen McCleary studied painting and printmaking (BFA) at Tyler School of Art, Philadelphia, PA, and graphic design (Certificate) at University of the Arts, Philadelphia, PA, as well as completing a custom interdisciplinary Master of Liberal Arts (MLA) at University of Pennsylvania, Philadelphia, PA. She currently works as a freelance graphic designer and fine artist and in her spare time is an avid amateur aerialist (static and flying trapeze, lyra, rope, and silks). The roots of her art lie in the process of collecting images, ephemera, and found objects, which she layers, alters, or arranges to create something new. 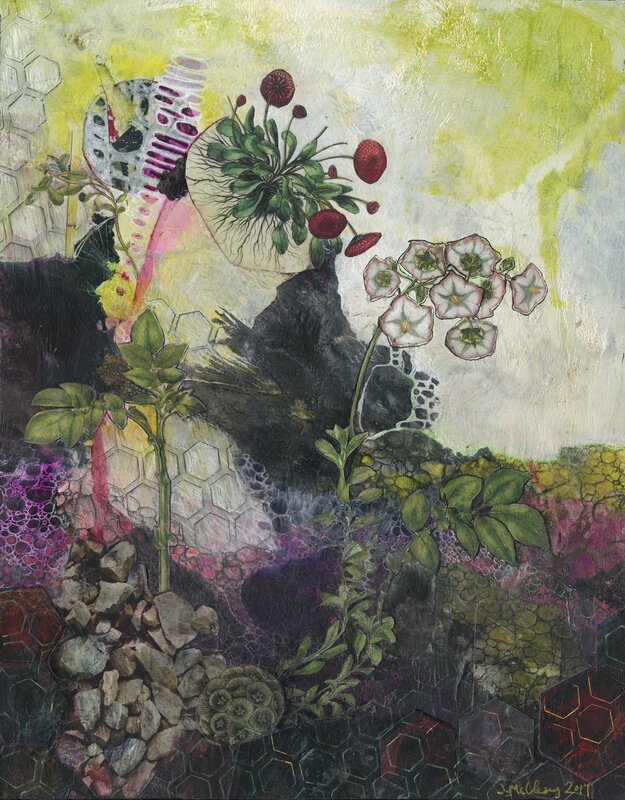 She works both digitally (photo-collage and graphic design) and in more traditional forms (mixed-media collage/painting and jewelry made from found and vintage objects). No matter the medium, she prefers to work intuitively, letting each piece evolve over time and in unexpected directions. Her work is more a form of meditation or playful exploration than a deliberate attempt at communicating a specific concept, although she does believe that images and objects can act as carriers of meaning and emotional resonance. She is interested in symbolism, wonder, hidden connections between things, the passage of time, imagined landscapes, ways of understanding the world, and dualities such as manmade vs. natural worlds, light vs. dark (metaphorically and literally), and complexity vs. simplicity.